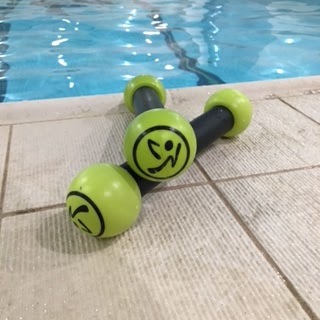 Last week, I got the chance to try out Aqua Zumba at New York Health & Racquet Club. Aqua Zumba, in addition to all the benefits of dancing, has the benefit of being a low-impact workout. Cardio workout: Dancing can improve cardiovascular health, increase stamina, strengthen bones and muscle and stave off illness. What’s more, depending on body type and intensity, it’s been found that you can actually burn up to 1,000 calories in a one-hour Zumba class! It’s Fun: Plus, busting a move can trigger the release of feel good hormones like serotonin and endorphins. It’s a social activity: A team of researchers discovered that dancing in synchronicity with others can have a surprising impact on health, wellness and how close we feel with those around us. Anyone can do it: Whether it’s in your living room, or at a studio, anyone can move their body to the music. It can keep your brain sharp: According to a study published in the New England Journal of Medicine, dancing on a regular basis is linked with 76 percent reduction in dementia risk. It’s gentle to the body: Unlike traditional cardio, dancing is more free and allows you to adjust to the tempo when you need a break. Especially Aqua Zumba! The class started at 6:30pm and I had just enough time to change into a bikini then get down to the pool. I got in the pool with a few other attendees. We started off the class with under water running where we would run to one side of the pool and back. I was actually surprised by how much “running” was involved with class but also the amount of arm work. The set up of class consisted with a warm up (running) then switched off between dance segments, more running, and arms. Similar to spin class, light weights (2 or 3 lbs) were utilized while dancing. Despite the simple moves (think bicep curls to the side and to the front), I could definitely feel my arms working a lot. There was also one segment in class where we ran to each side of the pool and did push ups against the wall (think more like arm dips against the pool wall). Each segment changed with the song so every segment was different. Taryn, the instructor stood in front of us out of the pool so we could see her moves while we worked. It was only a 45-minute class but it went by very fast! Of course, the music was awesome and upbeat during the workout as you would expect from a Zumba class (I can’t remember specific examples of artists she used but there was a decent amount of Pitbull playing). Lastly, if you’re looking for new workouts definitely check out Zumba! They are always coming up with new workouts. Pop Rock group Walk The Moon, of ‘Shut Up and Dance’ fame, teamed up with Zumba, the leading global dance-fitness brand, to create the exclusive, official choreography for their latest hit single, ‘Work This Body’. The band launched the super-catchy song a few weeks ago and today, Zumba is happy to present the fun routine that your readers can dance to. Check out the dance routine here and show off your dance skills! Thanks to NYHRC and Zumba for letting me try out Aqua Zumba! Zumba is the international dance and fitness furor that has vanquished the world, making practice a fun and fiery experience. There are additionally various advantages to exercising in water, would you be able to envision if there was a work out schedule that joined both. Aqua Zumba is the pool-based edition of the popular Zumba Fitness dance workout program. Find out about the health and fitness benefits of this fun Latin-inspired workout and what to expect at your first class. Wow, this is a great idea! I have to look for an aqua Zumba class in my area! I suffer from plantar fasciitis and I am abstaining from running now, so this low-impact and fun workout is possibly the best workout for me at the moment! Thanks for sharing!